Life in the kitchen has been missed. However, this week we had an opportunity to make something to satisfy our sweet tooth desires. 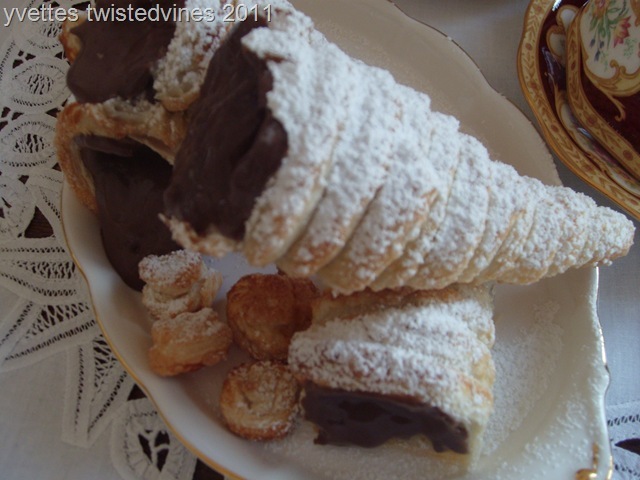 Chocolate custard and cream filled pastry horns. What a mouth full, I can assure you the title is long but the recipe is simple. I recommend this treat to anyone who doesn’t have much time to spare, if your planning a dinner time treat. Simplicity as it’s highest! The process is simple, and so are the ingredients. I prepared 20 pastry cases in 40 minutes, around 10 to 12 minutes baking in the oven, until golden, fill them with your favourites like strawberries and cream, orange flavoured custard, chocolate or white mousse or for an adults only a liqueur flavoured custard. 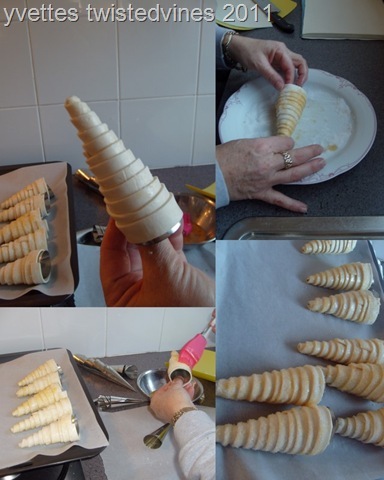 Cut 1 cm strips of pre-made puff pastry, wind around cone shaped moulds, only slightly overlapping. Coat with beaten egg and sprinkle coat with sugar. Place in a pre-heated oven 180° c for about 12 minutes or until golden. Fill with your favourite filling, I filled these ones with chocolate custard and cream. 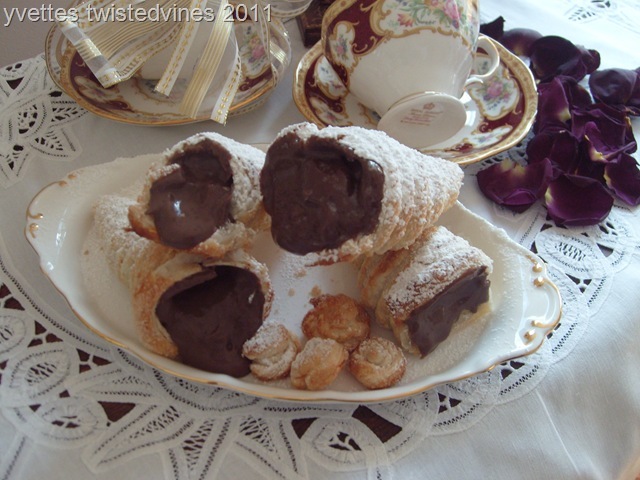 Sprinkle with icing sugar, and WOW…a decadent dessert! Those look so good! Sadly I don’t have any cone molds. They defiantly are, for my guests I served them with cream and fresh cut strawberries and also the second choice of chocolate custard. Can’t really stop at one! But aren’t really a delicate thing to eat, the puff pastry is flaky and buttery and the chocolate custard was a drooooling mouthful! LOL! 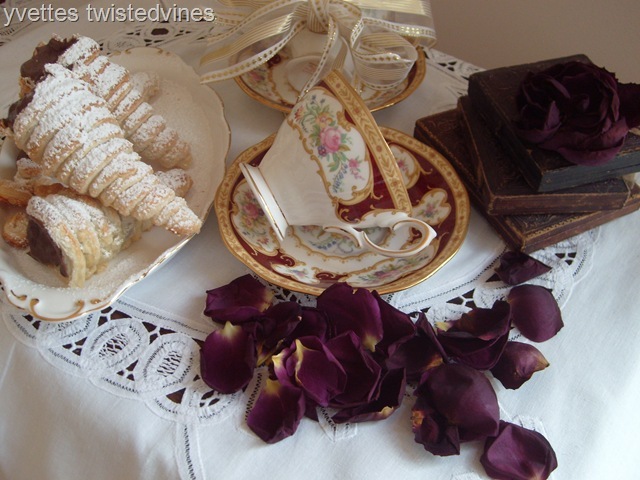 10 pm here and now I am seriously craving one of your Chocolate Custard Cream Horns! Excellent photos…they look good enough to eat! 🙂 LOL!